HomeAgrarian crisisThe farm crisis: why have over one lakh farmers killed themselves in the past decade? We, as a nation, are in the worst agrarian crisis in four decades. It is impossible to cover such a large issue in full. So I am going to be dealing with it in fragments today. I would like to stress that the crisis is so deep, so advanced that: firstly, no State, nobody, is exempt from this and it is not to be seen as the crisis of one State or one Government or one Party. It is a national crisis and we need to respond to it as such. It is a huge thing. In that crisis, the suicides are merely, however tragic, just a symptom and not the disease. They are a consequence, not the process. We can sum it up in one sentence — the process driving this crisis: the predatory commercialisation of the countryside (in the words of Prof. K. Nagaraj of the Madras Institute of Development Studies – MIDS). The reduction of all human values to exchange value. As this process unleashes itself across agrarian India, millions of livelihoods have collapsed. Lakhs of people are migrating towards cities and towns in search of jobs that are not there. They move towards a status which is neither `worker’ nor `farmer.’ Many will end up as domestic labour, like over a lakh girls from Jharkhand in this city of Delhi working as domestic servants. However, having said that, I want to say that the crisis is by no means restricted to India. It is a world-wide crisis of small holder farming. Small, family farms are getting wiped out across the planet and it has been happening for 20-30 years. 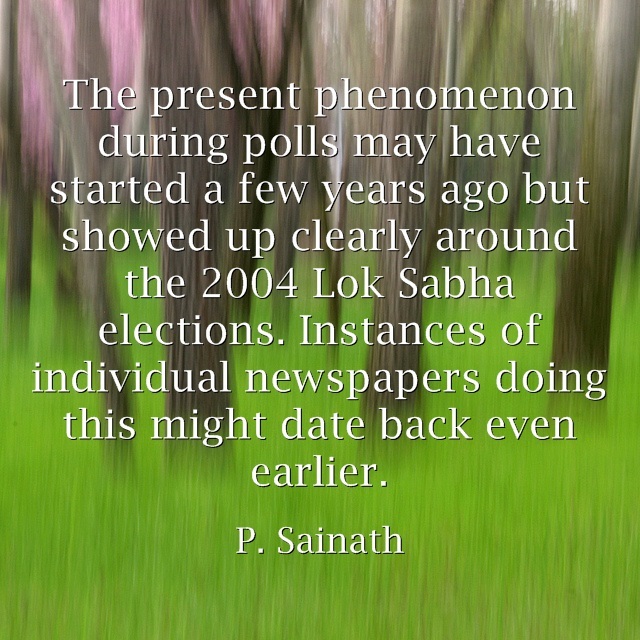 It is just that this has been very intense in India in the last 15 years. Otherwise, the farm suicides have caused major concern in Korea. Nepal and Sri Lanka have high rates of farm suicides. In Africa, Burkina Faso, Mali etc. have had high rates of farmers’ suicides as the cotton product there gets wiped out by the United States and EU subsidies. Incidentally, suicide rates among farmers in the United States Midwest and other rural regions have also been extremely high from time to time. In fact, in the eighties, suicide rates amongst farmers in Oklahoma, for instance, were more than twice the national suicide rate for men in the United States — and it is rare that rural suicides are higher than urban. I spent time last year on American farms and could see how they’re going down. We are witnessing in many ways the decline and death of the small holder farm. It is very important that we do something about it because we are the largest nation of small holder farms where the farmer owns that land. We are also probably the largest body of farm labourers and landless workers. If you look, there is a lesson to be learnt as to what has gone on in the United States. In the 1930s, there were six million family farms in the United States. At that time when India was just a decade or so away from gaining Independence, over a quarter of the American population lived and worked on those six million farms. Today, the US has more people in prison than on farms. It has 2.1 million people in prison and less than that on its 700,000 family farms. So what is this process driving towards? In two words: It is driving us towards corporate farming. That is the big coming picture of agriculture in India and across the planet. We have been pushed towards corporate farming, a process by which farming is taken out of the hands of the farmers and positioned in the hands of the corporates. That is exactly what happened in the United States and that is what exactly happened in a large number of other countries. This process is not being achieved with guns, tanks, bulldozers and lathis. It is done by making farming unviable for the millions of small family farm holders, by just making it so impossible for you to survive in the structures that exist. But there is a context to this that I am absolutely going to insist on framing that context. All these unfold in the context of the fastest growing inequality that India has seen in her history as an independent nation. And understand this, when inequality deepens in society, the farm sector takes the biggest hit. In any case, it is a disadvantaged sector. So when inequality widens, the farm sector takes a hit. Fourth rank in Dollar Billionaires: In India in 2007, I am sure you all will be very thrilled to know, we have the fourth highest number of dollar- billionaires in the planet. We are ahead of all countries in the number of billionaires except the United States, Germany and Russia. Incidentally, our billionaires are richer than those of Germany and Russia in terms of net asset worth. You can look up all these numbers on The World’s Billionaires at www.forbes.com – the Oracle of global billionaires. 126th in Human Development: We have the second richest billionaires in the world in dollars and we have the fourth largest number of billionaires in the planet. But we are 126th in human development. The same nation that has ranks fourth in billionaires is 126th in human development. What does it mean to be 126th? It means that it is better to be a poor person in Bolivia (the poorest nation in South America) or Guatemala or Gabon. They are ahead of us in the UN’s Human Development Index. You can get all these figures in the Parliament Library from the United Nations Human Development Reports of the last 10 or 15 years. 836 million live on less than Rs. 20 a day: We are the emerging ‘tiger economy.’ But life expectancy in our nation is lower than it is in Bolivia, Kazakhstan and Mongolia. We have 100,000 dollar millionaires, out of whom 25,000 reside in my city of Mumbai, I am proud to say. Yet, 836 million people in our nation exist on less than Rs. 20/- a day according to the Government of India. There is no such thing as Indian reality. There are Indian realities. There is a multiplicity of realities. Slowing down of infant death rate decline: The growth rate of our country is indeed the envy of many. But the rate of decline of infant mortality actually slowed down in this country in the last 15 years. The largest number of infant deaths 2.5 million takes place in this country, followed by China. CEO’s salaries set all time records: Chief Executive Officer ‘packages’ grew like never before in the last ten years. Indeed, the Prime Minister of this country felt constrained to make some remarks about the salaries of CEOs. You can remember the kind of pasting he came in for in the media as a result of having dared to question that maybe a CEO could live on a million less a year, or whatever it was. But while CEOs salaries have gone through the roof, farm incomes have collapsed. Appalling MPCE of farm households: According to the National Sample Survey, the average monthly per capita expenditure (MPCE) of the Indian farm household (across zamindars and your half acre wallas), is Rs. 503. Miserable expenditure patterns: Out of that Rs. 503, 55 per cent or more is spent on food, 18 per cent on fuel, clothing and footwear leaving precious little to be spent on education and health. What is spent on health is twice that of what is spent on education because we now have the 6th most privatised health system in the world. Therefore, the MPCE shows Rs.34 as expenditure on health as against Rs.17 on education. Rs.17 a month on education means 50 paise a day on education. That is the spending of the Indian farm household. That is the national average. I will come to state-wise figures a little later. Incidentally, we are very proud to tell you that labour productivity in the decade of the reforms went up to 84 per cent according to the ILO. The same ILO report informs me that while labour productivity went up to 84 per cent, the real wages of labour in manufacturing declined by 22 per cent (at a time when CEO salaries were going through the roof). So, in the last 15 years, we have seen the unprecedented prosperity of the top of our population. And at the same time, the net per capita availability of foodgrain actually declined for over a decade. Rising hunger at the bottom: The State of food insecurity in the world report of the FAO of the United Nations shows us that from 1995-97 to 1999-2001, India added more newly hungry millions than the rest of the world taken together. Hunger grew at a time when it declined in Ethiopia. A new restaurant opens everyday in some city of this country but as Prof Utsa Patnaik, our leading agricultural economist points out, the average rural family is consuming 100 kgs less than it did 10 years ago. The availability situation figure is one placed every year in Parliament in the Economic Survey which gives the net per capita availability (NPCA) of foodgrain contained in Table 1.17 (S-21). You get the numbers all the way from 1951. You can see how it has declined in the last 15 years. The NPCA was 510 in 1991, on the cusp of the reforms. That fell to 437 grams by 2003. The 2005 provisional figure was 422 grams. There may be a slight rise in one or another year, but the overall trend has been that of a clear decline over 15 years. A fall of 70-80 grams sounds trivial — until you multiply it by 365 days and then again by one billion Indians. Then you can see how gigantic the decline is. Since those at the top are eating much better than ever before, it raises the question of what on earth the bottom 40 per cent are eating? Two-nation theory passé. Its Two Planets now: Today, for the top 5 per cent of the Indian population, the benchmarks are Western Europe, the USA, Japan and Australia. For the bottom 40 per cent, the benchmarks are the Sub-Saharan Africa (some of whose nations) are ahead of us in literacy. Indebtedness has doubled in the past decade: The NSSO’s 59th round tells us that while 26 per cent of farm households were in debt in 1991, that figure went up to over 48 per cent – almost double by 2003. There have been huge migrations, as I said, as a result of this chaos and collapse of incomes, explosions of cost of living. Why is this framework of inequality so important to our understanding? We are getting further and further into the divide. What do I mean by predatory commercialisation of the countryside? I will come to that soon. But many things have happened. One is that as every Minister and every Prime Minister admits, public investment in agriculture has declined very sharply to the point of collapse over a period of 10-15 years. It is one of the things that the Government now feels that it is trying to reverse. Our foremost agricultural economist, Dr. Utsa Patnaik shows us that while total development expenditure as a share of GDP was fourteen and a half per cent in 1989-90, it was 5.9 per cent by 2005. That is a collapse of Rs.30,000 crore per year or an income loss of Rs.120,000 crore. I have often felt it’s simpler to send out the Air Force and bomb the villages It would probably cause less lasting damage than that withdrawal of investment costs us! There has been a crash in employment. Only the requirement of the last year and a half has somewhat (but far from adequately) been met by the NREGP, a programme which I am very supportive of. That has not opened up anywhere as much as it should. I hope it deepens and grows because it is a vital programme for the crisis in the countryside. It is one of the great things that we have done in the last two years. But very far from enough. Another problem is the rack renting of tenants. In the Andhra Pradesh suicides, you will find that many of those (in some regions) who have committed suicide were actually tenant farmers. Out of the 28 bags of paddy they harvested, they parted with 25 bags as the tenancy or lease rate. If there is a cyclone or damage or anything else, incidentally, the reparations and the compensation go to the absentee landlords. We have no tenancy reforms. It seems appalling to me that we can clear an SEZ in six months but we cannot do land reforms in 60 years across this country! Except in three states. Another issue is the exploding cost of agriculture, a process quite heavily controlled and rigged. Yet another one is the exploitative international agreements that we have entered into that are severely damaging to the interests of our farmers. Yet another aspect is the crashing output prices as global corporations have taken control of trade in agriculture commodities and rig prices. Even when While the coffee prices boom in the West, the men and women who grow coffee in Kerala commit suicide, especially between 2000 and 2003. The suicides are appalling. How many suicides have been there? I do not want to get into the numbers game. We are coming with a very major story on that in The Hindu in a while. I won’t pre-empt it. However, you were given last year, I believe, a figure of over one lakh suicides since 1993. That is a horrifying figure in 10 years. Yet, you will find it wrong. It is not true. For several reasons. I found that four years have been included in the number for which firm data on farm suicides do not exist. You bring down the average by bringing farm suicides in years which are irrelevant! We only started collecting farm suicide data from 1995 in the National Crime Records Bureau. Any new system of reporting takes time. Most States do not report properly for the first two years. It takes time for the States to get into the mode of reporting data. Real or stable data started from around 1997. So, the over one lakh suicides that you are looking at are not from 1993 to 2003 but they are from 1997 to 2003. That is an appalling figure. It is still a huge under-estimate for a variety of reasons which I will come to. But what is important is that the numbers are not the crucial issue. I think even the figure of over one lakh is appalling enough. What is frightening is that if you look at the data, two-thirds of the suicides are occurring in half-a-dozen States that account for just about one-third of the country’s population. Most of the suicides are occurring in cash-crop areas. The number of food crop farmers committing suicide is less as compared to those in cash crops. For the last 15 years, we have driven people towards cash crops. We have told them to export. Exports lead to growth. Regardless of the fact who is in power, we have pushed them towards cash crop and now we are paying the price of that movement. We have locked them into volatility of global prices controlled by rapacious corporations. It is often done by corporations whom your farmers cannot see, who are not accountable to your people. The other frightening thing is that the five or six States are also, in a sense, contiguous. There are other States which are pretty bad. These are the worst states. Maharashtra is the worst. Some of these States are showing an ascending trend. Some show a descending trend. What is frightening is that in some of the States showing an ascending trend, their numbers might double in six years. Zero farm suicides in Vidharbha? Farmer suicides in Vidharbha stopped entirely in August because the news came in July that the Prime Minister was to visit them. So, people thoughtfully stopped committing suicide. There was not a single suicide in Vidharbha in August. In official count, at least. They knew the Prime Minister was coming. Everybody said: “We will not commit suicide till he leaves.” This is a nation deluding itself. It does not help you. I am not trying to point at one Chief Minister or one party Government. It is a national crisis. The more honest we are with ourselves, the better positioned we are to sort it out. What do the figures actually suggest? If we project further the figures of the National Crimes Record Bureau, it is closer to about one-and-a-half lakh suicides in the 1997-2005 period. And that excludes eight categories of people because, for instance, in this country whatever you do, whatever laws you pass, our machinery will not accept women as farmers because there is no land in their name, there are no property rights for them. In Anantapur district of Andhra Pradesh, 45 per cent of farm suicides in 2001-02 were women farmers. Many of the households in Anantapur rural areas are women-headed since the men have migrated. There are much larger numbers. Even nationally, 19 per cent or nearly one-fifth households in this country are women-headed. But we do not count women as farmers. We count them as the wives of farmers. So, it is counted as a suicide but not as a farmer’s suicide. Of course, farm labourer suicides will never be counted in the list of farm suicides, so that brings it down further. Incidentally, countless eldest sons have not been counted as farmers committing suicide because, in our traditional society, the land remains in the name of the aged-old father, who may be 75-80, until he dies. So, the elder son may be 50 or 51. He is running the farm. He faces the pressure. He cracks and kills himself. The tehsildar says that this man is not a farmer because there is no farm in his name. In Yavatmal district last month, every single claim of suicide was rejected by a six-member ‘independent’ Committee consisting of top Government officers in the district plus two non-officials chosen by the government! Many of these cases were rejected on the basis that there is no land in those names. The guy was the eldest son, he was running it and looking after perhaps even three family units. But the land was not in his name. How do we accept him as a farmer? That is the criteria. I could go on about that. If you die and if you are found to be in debt, that debt has to be a bank debt. If it is a private money lender debt, it is not accepted. The Committee in Yavatmal will not accept it. They will ask: what is the record on that? There is no document to show it. In this way, thousands of people have been kept on the list of suicides but not in the list of farmers suicides. There is also misclassification. There are migrant farmers who are not counted in it. People leave the place and kill themselves in the city. I do not even want to conjecture what the real figure would be. It is impossible physically. Secondly, I think the number (the official count, however flawed) is appalling enough to move this nation. It should move this nation. If we have only these Government numbers, I will accept them at face value. If you can accept that it is a horrible figure, we should move the nation forward. What is common in these areas where the crisis is taking place? Cash crop, high water stress, huge indebtedness way above the national average. If you make a map of indebtedness of India and the map of all suicides, they will converge very neatly. The highest number of indebted households in the country is in Andhra Pradesh which is at 82 per cent, Kerala has 64 per cent and Karnataka has 62 per cent of all farm households in debt. The list is endless. You can see how the suicide map matches that of indebtedness which is one of the important single major causes. I would like to say that almost every suicide has a multiplicity of causes, not just one. What we do in recording them, though, is to record the last cause. I am indebted. My son drops out of college. I am unable to get my daughter married and I am humiliated by the money lender every day when I go to the market. My crop collapses and the bank refuses to give me a loan. I go home getting drunk. I fight with my wife and then commit suicide. The next day, it is recorded that the reason for the suicide is that he had a fight with his wife and, so, he killed himself. The last cause gets recorded. That is natural and that is how it is structured. But it conceals more than it tells. The other common thing in the suicide-hit regions is withdrawal of bank credit. Agriculture tends to be more deregulated in these areas as in parts of Vidharbha and Maharashtra. You have a very high cultivation cost. That too, is common in these areas. Extremely high cultivation costs. In Vidharbha, in 1991, it cost Rs. 2500 to cultivate an acre of cotton. Today it costs over Rs. 13,000 per acre using the new BT brand. You are talking about a 500 per cent increase in the cultivation cost per acre. It is killing. It cannot be borne. If you want to understand how gigantic input costs are, if you want to understand how massive is the industry for seeds which we have left open to a handful of corporations to control and loot, see what is happening in Andhra Pradesh. You would understand how major a cost it is. Andhra Pradesh, my own home State, is so proud of its software exports. But, the seed and other input industry of Andhra Pradesh is worth more than AP’s software exports. That is how big, how huge, the seed industry is. People in this country spend more on seed than AP earns exporting software. We are running after software markets overseas, which is fine, but while allowing the seed market to be taken away absolutely by a bunch of corporations. Which is not fine at all. That is how I said that we are moving already, at this level, towards corporate farming. Look at income. Income collapse was a major part of the crisis. In several regions, farm incomes have simply collapsed. The national average monthly per capita expenditure (MPCE) of the Indian farm household, as I told you, was Rs. 503. It is pretty close to the below poverty figure of Rs. 425 or so of rural India. Six States on an average have been below the poverty line It is below Rs. 425 figure. Five or six States exist in the country like that. There are many households existing on a monthly per capita expenditure of Rs. 225. This is according to the National Sample Survey Organisation. The per capita monthly expenditure is Rs. 225 which translates into Rs. 8 a day. In that, you are going to manage your food, clothing, footwear, education, health and transport. What does it leave for any kind of life? You are always in debt. 55 per cent has gone to food, 18 per cent to fuel, footwear and clothing. In all these areas, you will find a very high proportion of school and college dropouts. People with B.Sc. degrees have dropped out to work as farm labourers on the family farm in order to get it somehow going, while our Agricultural Universities have simply taken up the job of doing research for other parties like private corporations but not for our farmers any more. How do the elites look at the crisis at the bottom? Let me quote from a leading economic newspaper of our country. One of its commentators says this with some disappointment. “The bottom 400 million are a disappointment.” Why? They do not buy enough. I do not know what they will buy with Rs. 8 as per capita expenditure. She says that they do not buy enough. But they have a responsibility. “It is a difficult market to tap,” the commentator concludes. What about Vidharbha from where so much of reporting has been done on the suicides in the last few years? As Mrs. Alva has said, what you see in the media is very little. Dozens of local journalists have kept this issue alive. They have to be given credit for it. How many suicides have there been in Vidharbha? Have they declined? According to one section of the media, they have stopped. The government has in fact put out several sets of figures over time which are quite contradictory. The Government has not put its name or signature to any figure of decline at the highest level. Why? It is because the Government will be in serious trouble. There is an order from the Nagpur Bench of the High Court that the State Government must maintain a website with all the figures. It is in response to a public interest litigation. If you look at the Government website, you do not need to read any of the reports. The figures in the website are so obscene and what do they do to bring a decline? Let me tell you the actual number from the Commissioner of Amravati’s own report and how these are then presented. In Vidharbha, the number of total suicides, not the farming suicides, in six districts was not 1500. Since 2001, in the crisis years, it was not 2000, it was not 1300 and it was not 1700. The police stations record it as 15,980 for the six districts. Not all of these are farm suicides. But here is the fun. From 15,980, they will bring it down to 578 or whatever figure is finally arrived at. We can bring this down. Incidentally, these are 100 per cent rural districts. But the final tabulation shows that less than 20 per cent of these 15,000 suicides were farmers — in 100 per cent rural districts! It is a mystery then, who those committing suicide were and are. These were not industrial districts. If just 2939 were farmers, that is less than 20 per cent of 15,980, then who were they? It almost as if only farmers were doing well! Indeed, very well. Everybody else is committing suicide. I give full credit to the Maharashtra Government for one thing. They did the biggest study on farming households in the state. It is only that people should take some time to read that study. It will just chill you to the marrow of your bones. Thanks to the Prime Minister’s visit due to which everybody got busy. They surveyed every one of the 17.64 lakh households (nearly ten million human beings). Every single farm household was surveyed in the six districts of Vidharbha the government believes are affected. (In all, Vidharbha has 11 districts.) What does that figure show? These are figures based on the survey which appear in the report of the Commissioner of Amravati (which document I have promised to give you.) Five of the six affected districts come under the Commissioner of Amravati. But the data he is citing includes even the sixth, that is Wardha district. close to 75 per cent of the farm households in these nearly two million households (17.64 lakh) are in distress. It says that 4,31,000 households, if you take the rural households having five to six people in each household, are in “maximum distress.” That is the word of the Government. The other category is “medium distress.” I have no idea what that means. But it admits 75 per cent of the households are in distress of one kind or the other. Astonishingly, over three lakh families are having severe problems on the marriage of daughters which is a big cause in several suicides. Over three lakh farmers are not able to get one or more daughters married. This is an explosive situation. The Government’s own study shows that indebtedness was also a factor in 93 per cent of the suicides that it looked at. Last year suicides were supposed to have declined after the package. Last year the police station records show 2,832 suicides as against 2,425 in 2005. It is an increase of 407, which is a very significant increase. Because that’s an increase of over 60 suicides per district in each of the six districts in just one year. And there’s a lot more in similar vein. How do they then make out a ‘decline’? I think it is the Indian national genius of handling numbers. I just love numbers. The first category (police station records) states 2,832 suicides last year. The second column says, out of these “farmers’ suicides” from 2,832 it falls to 800-odd. The third column says suicides by “farmers’ relatives” as if others on farm are not farmers. That becomes 1600. So, suicide by farmers is different from suicides in farming households!. Then comes “cases under inquiry.” Then, other tables which list cases due to “agrarian distress.” With each column the number comes down. The final column is the masterpiece. It does not exist anywhere in the planet. We have a column called “eligible suicides”, like eligible bachelors or brides, etc. It means those suicides where the families are deemed by government to be eligible for compensation. So, from 2,832 it comes down to 578 in the last column. It is this last figure of ‘eligible’ suicides that is put out by officials as the suicides figure! This month (August was the month just concluded) we do not have suicides at all because if you let our mathematicians pursue it further, they will redefine suicides out of existence. But the total number keeps increasing. You can see it. This year when there were no suicides, or suicides were in steep decline, there were 700 plus suicides according to the Government of Maharashtra website. Why does not the Government put its signature to the number? It is because that website is maintained under the court order. Then you are running into serious problems if you contradict your own data. We can play games with that endlessly. I’d like to narrate three personal episodes from the affected households. For me the most painful thing is that second and third suicides are happening in the same households. In the 700 (suicide-hit) households that I have gone to and seen over the years, the most hurting thing is that when you are leaving the household, when you make eye contact with the lady of the house or the eldest daughter, you know – do not ask me how I know – that she is also planning to take her life. You know that for all your boastfulness about the might of the Press and the power of the pen, I cannot do a damn thing to stop them because that is how we are today as a society. That is the most painful thing for me. I’ve started avoiding that eye contact because I do not want to see in the person’s eyes that she is also going to take her life. When a young widow takes her life, she might kill her girl child also because she does not want that child forced into prostitution. Last year, when Prime Minister came, there was total chaos because everybody was kept on notice, because the Prime Minister was really worried about what was going on. He took a trip which was not really scheduled. One month before he came there, I was in the house of Gosavi Pawar. This was a very different kind of Pawar, a less privileged Pawar, an adivasi Pawar and not to be confused with more the illustrious Pawars. Gosavi Pawar was from a Banjara family. The clan is so poor. Incidentally, that day I was sitting in his house I had also read about the wedding of daughter of India’s richest man, Lakshmi Mittal at a cost of 60 million dollars or pounds. It is obscene in whichever currency it is translated. Poor man, Mr. Mittal, he could not get a wedding hall in Paris! It is very difficult to get one there in that season. So, he hired the Palace of Versailles and held the wedding there. But in the house of Gosavi Pawar, the clan is so very poor. They had come all over the country for the wedding and decided to have three weddings at the same time in order to afford them. They decided to have three weddings at the same time because people had come from different regions and states. They had all gathered there. Gosavi Pawar, the patriarch of that clan, was unable to raise the money required for the sarees for those weddings. 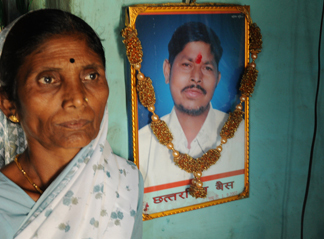 Humiliated by the moneylender, by the bank manager, and others, Gosavi Pawar took his life. I saw two things. One that depressed me enormously and one that inspired me about the poor people of this country. One that depressed me enormously is the poor household had three weddings and a funeral on the same day, because they could not cancel the wedding. It would have bankrupted the clan had they gone back to Rajasthan, Gujarat and Karnataka or wherever and come again. So, they held the weddings. The brides and bridegrooms wept. The most heart- breaking moment was when the wedding procession went out and on the highway met the funeral procession. Dr. Swaminathan would remember that when he came to Yavatmal he encountered a similar situation, when suicides were being brought to the hospitals even as the National Commission on Farmers (NCF) team were holding discussions with the Government officials. So, the wedding processionran into the funeral procession of Gosavi Pawar. Then, people who were carrying his body ran into the fields and hid so that they would not cast a bad omen on the wedding. But there was also something very inspiring. Some of the poorest people on planet Earth made those weddings happen. Everybody contributed Rs. 5, quarter kilo of wheat, half a kilo of rice, one sheaf of banana, a coconut, whatever they could. They held those weddings. They did not have the resources to do it, I am afraid, in the Palace of Versailles. But they held those weddings by community action, by public action. I felt so proud at that moment that our people showed the decency and dignity that the elite have so completely forgotten. Coming back to ‘eligible suicides’ in Vidharbha, there is nothing that prevents the Government of Maharashtra from implementing its poll promise of Rs. 2700 per quintal of cotton. What did they do after coming to power? I am not singling out one Government. Let me make it very clear agriculture is in desperate shape across the country. All Governments are culpable. Everybody is fragile. No State is exempt. But in this particular case, they made a promise of Rs. 2700 rupees, but they lowered it by Rs. 500. They withdrew Rs. 500 of the so-called ‘advance bonus’ payment. With that, it removed Rs. 1200 crores from the farmers. After removing Rs. 1200 crores from the farmers, the Chief Minister announced a package of Rs. 1,075 crores. A package of Rs. 1,075 crore is being given to people from whom you have taken away Rs. 1200 crore! At the same time, the US, the European Union were drowning their cotton growers in subsidies. Cotton growers of the US are not small farmers, they are corporations. How many cotton growers do we have in Maharashtra? It is in millions. How many cotton growers are there in US? It is 20,000. When we removed Rs. 1200 crore from our farmers, how much did the US give to its corporations? On a crop value of 3.9 billion dollars, the United States gave its cotton growers a subsidy of 4.7 billion dollars. It destroyed the bottom of the international cotton market. The cotton price at the New York exchange ruled at 90 to 100 cents in 1994-95 fell to around 40 cents and from that date suicides began all over the world as prices crashed and farmers ran up horrible losses. In Burkina Faso, hundreds of cotton farmers killed themselves. In July 2003, the Presidents of Burkina Faso and Mali wrote an article in New York Times, “Your Farm Subsidies are Strangling Us”. We were not able to take action against such subsidies, them. While our duties on cotton are 10 per cent, if you are a Mumbai textile magnate, then you do not pay even that ten per cent. You get it waived in lieu of export of garments. Incidentally, if I am a Mumbai textile magnate, I can even get the cotton free because private corporations dumping cotton in India would give me six months’ credit. In six months credit, I can run the entire cycle from cotton to cotton garment. So, I am essentially getting an interest-free loan from you which I return in six months and I have made huge profits. All these games are played around the lives of millions of people. For me the saddest thing is your (Mrs. Alva’s) comment on the media. As a journalist, I totally endorse this. The saddest thing last year that happened was when less than six ‘national’ journalists were covering the suicides in Vidharbha. Five hundred and twelve accredited journalists were fighting for space to cover the Lakme India Fashion Week. In that Fashion Week programme, the models were displaying cotton garments while the men and women who grew the cotton were killing themselves at a distance of one hour’s flight from Nagpur in the Vidharbha region. The irony of it should have been a news story, but nobody did that story except one or two journalists locally. We withdrew the money of the advance bonus of Rs. 500 a quintal at the time when the US and EU were increasing their subsidies. I went last year to US and visited American farms. Including corporate style dairies. The subsidy per cow every day is twice your National Rural Employment Guarantee Programme minimum wage. It is around three dollars per cow which is Rs. 120. Double your National Rural Employment Guarantee Programme wage which is Rs. 60. That is why my friend, Vijay Jawandia from Wardha, put it so beautifully in a television interview. He was asked – Jawandia saab what is the dream of the Indian farmer? He said the dream of the Indian farmer is to be born as an American cow because they are getting three times the support that we do. We have locked the farmer into global price shocks while removing whatever safety nets they had. We have not been able to fight the EU-US cotton subsidies. We have deregulated agriculture to an extent where the quality of seed has now been graded much lower. In the sense, when you bought a bag of seed, on the back of seed, it will be stamped – 85 per cent germination rate guaranteed. That is now 60 per cent. It means if a village buys 10,000 bags of seed, they are paying for 10,000 bags, but they are getting 6,000 bags because we have lowered the standards through MOUs with companies. The seed industry, as I said earlier, is bigger than software exports. The agricultural universities have collapsed. The extension machinery, as the Government of India itself says, is in a state of complete disrepair. At the time the advance bonus was withdrawn, we begged the government: Please do not do this as suicides could double. We were wrong. In some places, they tripled. We begged – do not do this, do not do this, do not remove this, it will really kill these people who are in a very precarious stage. Incidentally, by the end of 2005, there was a unique G.O. in Maharashtra. I do not know if you are aware of it. In Maharashtra, it has 14 hours’ or 15 hours’ power cut whereas the best localities of Mumbai have never a problem of power cut, not even for one minute. The beautiful people cannot be subjected to power cuts. Incidentally, a 15-minute power cut in Mumbai would give two hours of power to all the 11 districts of Vidharbha, but the children of Vidharbha were not given that concession even during the exams. That is why Vidharbha’s performance in HSC exams will always be worse, though the topper is from Vidharbha. So alongside the withdrawal of the bonus, a new G.O. came. We have exemptions for power cuts. Do you know what was exempted in the new GO of 2005? Post-mortem centres were exempted from power cuts because so many people were being wielded in for post-mortem. They exempted post mortem centres from power cuts along with Armed Forces, Police Stations, Fire Brigade etc. Right now, as I speak to you, there is a second sad part – we are in the spraying season. There are three seasons when suicides shoot up. It is not common across the year. In some months it is very low. In the spike seasons they are very high. The first spike comes in the credit season when the farmer goes out in April-May, looking for the money to buy their inputs for the new season, trying to get that Rs. 8,000/- or whatever amount it is. I have covered farmers who have committed suicides because they could not get Rs. 8,000/- at a decent rate of interest in 2003 and in early 2004. Then, I have gone back to my house as an urban middle class professional and got a letter from a bank, offering me a loan to buy a Mercedes Benz at six per cent rate of interest with no collateral required. What kind of justice is there in that society? Where is the humanity, where is the compassion and, above all, where is our sense of outrage? Where is the outrage about this, that I can buy a Mercedes Benz for six per cent rate of interest without collateral whereas a farmer who could buy a productive investment like a tractor is bankrupted by the terms of loan? There is no fairness in the system at all. Credit expansion — to whose benefit? The indebtedness of Indian peasants, as I said, has doubled and I gave you the figures from some of the major States. We have been told repeatedly that there is a massive credit expansion and indeed there is. I can assure you that it is not going to the farmer. Some of you know very well as to which cooperatives it goes to and who runs what. All these things are very well known. What has happened to the credit expansion? How do you expand credit when you have closed 3,500 banks in the rural areas? Rural areas have witnessed the closure of over 3,000 banks between 1993 and 2002. And more since then. Private banks are only now beginning to come in. It was only the nationalised banks which worked in the rural areas. There expansion of food production associated with the ‘Green Revolution’ would actually not have taken place without the banks being there and providing the credit for the farmer to do that. Banks have systemically withdrawn from credit and bank branches have closed down in thousands. There has been a diversion of credit to the upper middle classes, the consumption of all of us in the cities indeed. The so-called Gramina Banks are playing with tens of crores of rupees in the Mumbai Stock Exchange! The undermining and re-defining of what we call priority sector lending has a lot to do with it. We redefine it. Under agricultural loan, you can buy a Qualis or Tavera or Scorpio or other luxury vehicle — as an agricultural loan! While non-agricultural loans go to farmers who pay non-agricultural rates of interest, non-farmers are buying Taveras or Hero Hondas and Qualis with ‘agricultural loans’ and this at reduced rates of interest. This is a very widely documented thing and I could place everything before you. It is also very important in the whole crisis. Agriculture is not an island: Do not disconnect farming from the rest of what is happening. The cost of living expenses have simply exploded across this nation. Today, health is the second fastest growing component of rural family debt. Health is the second fastest growing component because we have the sixth most privatised health system in the world. If you look at the NSS data, it suggests that nearly one in every five Indians, nearly two hundred million human beings, no longer seek medical attention of any kind because they cannot afford it. This is not because of accessibility or distance. It is because they cannot afford it. The same nation boasts of boosting ‘medical tourism.’ But that is the situation. The farmer is hit on all fronts. The situation of farm labour is even worse. The landless labourers’ plight is even worse, but he is not tied to the land (except where bonded). So, the entire series of processes is buffeting the farmers in every case. Last year, Andhra Pradesh started jailing elderly farmers who were unable to ay their debts. Now, the AP Government has called a halt to it. They were put in jails for debt. Seventy-four-years or seventy-five-year-old farmers were put in jails, but that is now being stopped. India pioneered the concept of ‘social banking.’ It was a Gandhian idea. It was recognised that there were some operations, some classes of people, who you advanced loans without expectations of huge profits. Like marginal or subsistence farmers. We have withdrawn from that idea of social banking. We all talk about moneylenders. One of the things which I want to tell you is that the face of the moneylender has completely changed. Please do not focus too much on your village sahucar. Sure, he is an exploitative creature. He is also a very pathetic creature in the new dispensation. A whole new class of moneylenders have come to the countryside. The village sahucar, the small sahucar is committing suicide because his clients are bankrupt. Some clients have migrated and they have run away and nobody is repaying his debt. Who then are the new moneylenders? They are input dealers, the people who sell seeds and who sell pesticides, fertiliser and other inputs to the farmer. The people who own the shops that are selling the seeds are millionaires now. When you come to pesticides, input costs have simply exploded. Let me give you an idea to prove how major it is. When we spoke about interest waiver, I begged at that time: “Do not do the interest waiver. It will be the cooperative banks that will benefit. If you want to do a waiver, do a loan waiver.” After all, we have waived loans of thousands of crores of rupees for a handful of industrialists. Look at your Non-performing assets (NPA) list. It is a “Who’s Who” of the Indian industry. Running to tens of thousands of crores. But we could not waive the loan of Rs.25,000 per Vidharbha farmer which would have wiped out 80 per cent of their bank debt. I begged at that time when the ‘relief package’ was being formulated. I said: “It is more packing than package.” I said that the cooperative banks would take the money. Indeed, the cooperative banks are, for the first time in 10 years, on a hiring spree because they have so much money. They have got a Rs.712 crore gift! We also gave a moratorium of two years instead of giving a loan waiver. What is the result? The two-year moratorium comes to an end in March 2008. With the existing loan plus the pending loan plus the current loan, the farmer is in for a gigantic shock in March 2008. There is no chance of repaying. But we did not do that. Only in the case of Tamil Nadu, there was a major waiver. You can reason out why Tamil Nadu was given that privilege. I am very happy that they were given that privilege and I just hope that that privilege would be extended to all the others and the other Governments do the same. Input costs have gone up to a point where there is no return. If you look at cash crops, you can find it. I will just take input cost in respect of seeds. Take the case of di-ammonia phosphate (DAP). One bag of DAP cost Rs.120 in 1991. It costs four times as much now. Seeds were available at Rs.7 a kilogram of local variety. I mean, in Vidharbha, local cotton seeds were available for Rs.7 per kilo. You could get the bill (for transactions of that time) even now. Just Rs. 7 for a whole kilo. It was Rs.1800 for the BT cotton seed (per 450 gram packet) in 2004 before the Andhra Pradesh Government took Monsanto to court. It got the price dropped down to Rs.725. I give full credit to the Government of Andhra Pradesh for having taken that action. Today, the utility prices have gone up; electricity prices have gone up and the farmer is buffeted by the entire series of price shocks. At the same time, the output prices have crashed. The little district of Wayanad in Kerala lost Rs.6,000 crore on two products of coffee and pepper which are not doing that badly at the global level. In just four or five years, they lost that much. Somebody else is making the money because they have been locked into a trade where the Spices Board, all our institutions, are operating on behalf of the private corporations and not on behalf of the farmers. When I went to the Coffee Board in Wayanad, Kerala, they were very nice to me. The moment I entered their office, the Coffee Board people offered me a cup of tea! That is how they promote coffee. The farmers in this part of Kerala are growing the coffee. Coffee does not grow in most Western climates. Your farmer is growing coffee and he gets pathetically less than 10 per cent of the turnover of what goes on at the global level. In 2001-02, thousands of people were beguiled into growing Vanilla. Why? It fetched Rs.4300 a kilogram at the time – at the start. This is also one of the tricks of the corporate farming and contract farming. It fetched Rs.4300, per kg meaning thereby $100 per kg of Vanilla. That was the price the farmer got. I do not know what is the exact price today. I think it is around Rs.86 a kg. It is not a fluctuation. That is an annihilation. This volatility has killed them. However, we have chained our farmers to all these things. Are there solutions to these problems? Yes, I have not covered a lot of issues. I can take the questions from you on that. For one thing, I would appeal to you to read the reports of the National Commission on Farmers. There is something very important about the reports of the NCF. They have wide acceptance. Almost every major farm union in this country has supported it regardless of party – whether it is the Congress or the Communist or the BJP or the Dravidian parties. Across the political spectrum, people have supported the recommendations of the NCF. Then, what prevents us from moving ahead on at least the major recommendations? What prevents us from creating a Price Stabilisation Fund for important agricultural commodities the way we have it for petroleum. We do have a Price Stabilisation Fund in the case of petroleum. The State kicks in when the price becomes unbearable and withdraws when it stabilises. What stops us from using social banking techniques? There is a rule, a law in this country that 1 per cent of all loans (at 4 per cent interest only) has to go to the poorest of the poor. Over the last 10 years, we have not even fulfilled that one per cent, according to the bank unions of this country. The industrywide average is 0.25 per cent! We have given no protection to the farmers against dumping and the Western subsidies. We have not sought the revival of the agricultural universities as the National Commission has appealed for. We could do a five-year credit cycle. You can give the farmer a loan over a five-year cycle instead of making him go back on his knees to the corrupt bank manager every six months, every season. In five years, you will have two good years, two bad years and one neutral year. So you might manage. There are many such recommendations which we could use. They are really very sincere ones. As I said, it is not politically difficult to get them accepted. They have been accepted across the farming political spectrum. You are talking about 600 million people here. There are three broad principles which are on the larger canvass. First, do not treat agriculture as a headache or a cancer. It is not. It is central to the livelihoods of hundreds of millions of people. We have to approach it with reverence for what it represents. Second, declare agriculture as a public service and treat it as such. Those who work in agriculture, they lose out a lot. Average incomes in agriculture are much lower than any other sector. Let them be compensated for the food they put on our table. They lose out a lot. Those remaining in the sector should be compensated by society. Third, let us end the hypocrisy of subsidies. There is no part on the globe where agriculture exists without State subsidies, without State intervention. In fact, the richer the country, the greater the subsidies — but they are not going to the farmers — they are going to the corporations. What we give our farmers does not even qualify for subsidy but as pathetic life supports. Let us not remove them. Let us honour those who put food on our table.